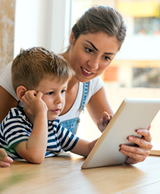 Our products are used and recommended by several professional organizations that work with children and adults with special needs, including: Learning® Magazine, The Well-Trained Mind, Creative Child Magazine, Sylvan Learning® Centers, Club Z In-Home Tutoring, and leading schools throughout the world. We guarantee better grades and higher test scores—or your money back. We offer two basic approaches to helping students with special needs. Both approaches involve improving critical thinking skills, but our full curriculum products also offer additional advantages —see below— that make them more effective with many students with special needs. We strongly recommend using both approaches for the very best results. Deeper analysis produces deeper understanding, which results in better grades and higher test scores. Over time, students who practice critical thinking learn to apply it throughout their education and lives. Many students with special needs face major learning challenges. Improving their critical thinking leads to beneficial results across the curriculum. To find the right critical thinking products for your student, search under the grade level of the student and Critical Thinking. The search results will show you our award-winning critical thinking products for that grade. If you want to talk to an education specialist, call us at 800-458-4849. Are you concerned about trying to help your children with their curriculum? Don’t be! Our full curriculum products make it easy. We designed the lessons to make sure each concept taught is clear and easy-to-understand. Many of our lessons include helpful diagrams and pictures to help students understand and visualize concepts and steps. We also integrate critical thinking into our full curriculum products so students have to analyze and practice what they are taught. Deeper analysis produces deeper understanding, which results in better grades and higher test scores. Over time, students who practice critical thinking learn to apply it throughout their education and lives. To find the right products for each student, search under the grade level and the target subject. The search results will show you our award-winning products for that grade and subject. The full curriculum products will be highlighted in the search results. The results will also show you several supplemental products that focus on specific skills and concepts. Children love our products and you’ll love what our products do for your children!